I am sorry I missed this article when it was first posted since I was at an agility trial with my rescue border collie mix (who I really enjoy), bugging the crap out of my teacher while I kept going between happy my dog was doing better to irritated that she still hates the teeter totter, LOL. I dress cheap though. You left out the “agility spouse”! Pretty decent article with the exception about people wanting border collies. I have had four and they are wonderful pets. I compete because I enjoy the sport and so do my dogs. Yes the Q is wonderful and the icing on the cake but my dogs enjoy it as do i. I also compete in obedience with them which I’m sure you will have an article on “those types” sometime. Not all agility people fall into those categories that you made up. This type tends to have a lot of dogs because they are generally not satisfied with the dogs they have and always looking for that next dog which will achieve all their ambitions. They often complain about their dogs, that the dog won’t keep bars up, hit contacts, go fast enough, pay attention, do the weaves. A subset complain a lot and tend to be the ones that train little and trial often, which explains why the dog makes little progress. They are happiest when they have a new dog, with all its great possibilities, before the fatal flaws have become apparent. ps. I really do agility and have three rescues. Too funny! 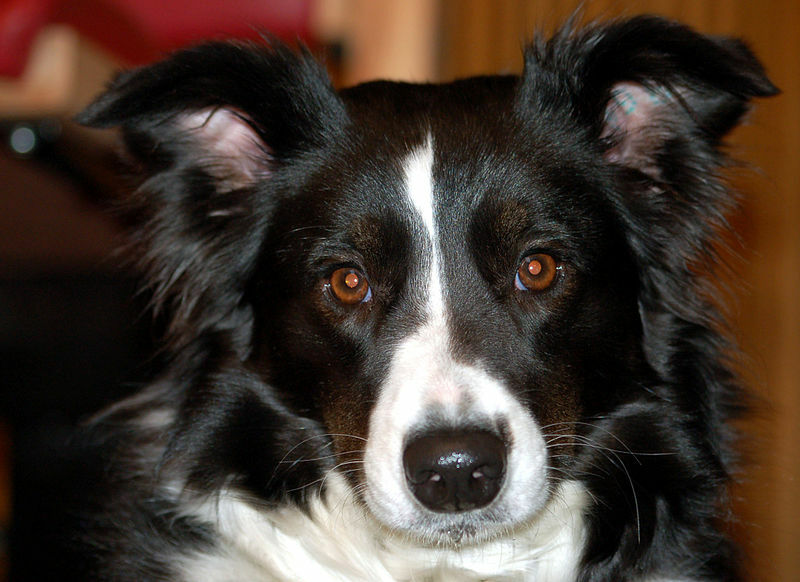 I have a 5 yr old border collie – fell in love with her at a week old from a photo and went looking for something to use her brain for good rather than evil. We’ve got a few titles between us, but we’re not exactly seriously serious, just love to play and play well. Still wear jeans & a t shirt, but have succumbed to the convenience of lock laces on my cheap child sized cross trainers. We keep turning up expecting to be turfed out as imposters, but winning a fair few when we don’t crash and burn, ‘cos we’re having too much fun. I think maybe I might have a BC personality, but slightly less body hair. READY for anything. Wanna play? SNORT. I, too have a Border mix (crossed with a Kelpie) who is my first dog I have owned. I took up agility in order to provide her with the work and exercise she needed. I am definitely a CC, and we do it for the fun!!. I also train & teach other to have as much fun we we do. We have a few titles; CD, ADX, SDX SPDX, GD, JD, ET, DWDF.S, but it’s taken us 6 yrs of competing to get there. I know people in all of those categories. I, of course, do not fall into any of the groups. I guess you could call me a reverse ex-conformation type. 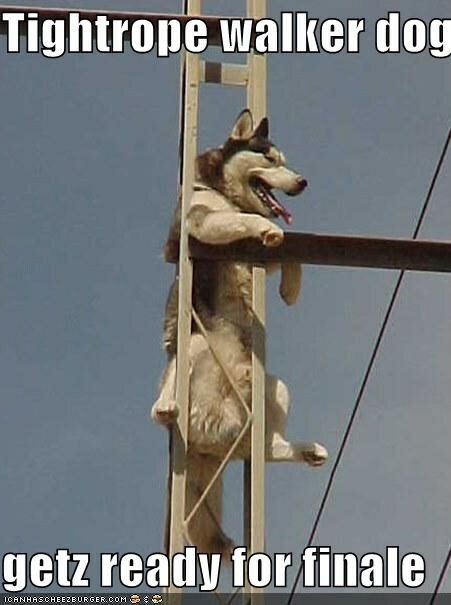 I like training and I do conformation because someone told me a balanced dog has titles at both ends. My split personality is evidenced by my moderately biddable breed – Airedale Terriers – which means we do everything and don’t excel at any of them. But we laugh a lot. A funny one heard a ringside. At 9am a dog struggled with the ‘A’ frame and spectators though it was down to the sun being in a low orbit. Chap beside me asked if I thought that the sun would be in the same place when he ran his dog at 2pm……… The man’s job turned out to be a navigation officer in the merchant navy! You guys are fantastic. This is my new favorite blog. Keep up the good work, ladies. Hah! I’m probably one of those annoying RA types, but I tried not to hog the instructor’s attention in class. My Basenji & Basenji-mix both loved running agility courses (on their own terms, of course, not in the order I wanted them to). However, I was the one too out of shape to keep up with them, so I stopped taking classes. I am the agility type who just enjoys showing and getting Q’s but have never been to a national. Just going to trials and meeting other people who enjoy showing there dogs. I am 63 years old and have been showing for about the last 20 years with shelties. I also enjoy trials and will probably never go to a national, I was at the national this past week-end as a spectator…lol .We have only been competing for 2 years, I had always done obedience but my sheltie girlie was bored to death, so we started a foundation class never intending to compete, and got hooked. We still do obedience, but I love agility. We have made it to Masters Agility Preferred and Excellent Jumpers Preferred. I admit, I am still green but I learn from my mistakes. I also have a male that is in Novice. Love this post. I guess I am the CC. You haven’t seen Wendy Donnelly’s little Black & Tan Micro Pomeranian Dottie do agility yet. Now, that little baby will give them something to talk about! Okay, I’ll admit it I am a weird breed person who loves agility. But honestly it’s not so my Pyr Shep, Tibetan Terrier or Schapendoes can go to the Invitational (doesn’t really matter for nationals). It’s just that I love hair. Long beautiful hair, grow it show it. HAIR!! article is cute! i tried agility with my adolescent male herding breed dog. he didnt love it. he would do the dog walk and a frame and tunnel pretty well. his fave was the table. the bars and weaves–EH….we didnt get to the teeter exactly yet….my instructor said that because we hike off leash all the time that my dogs are used to RUNNING AMOK. i think this should be an additional agility category. we hike all the time and my dogs jump over logs and now in summer we all dive into lakes. his favorite trick is to try to dive on top of me and then swim on top of me. my job is to teach him boundaries in the water. we are hours from the closest dock diving facility so we havent tried him out there but think he has potential. now though, every day he will chase tennis balls or lunkers into the water non stop. maybe a bit like a border collie??? Conformation person, “Best in Show” fan, devotee of good satire. Does anyone remember the site “Agility Barbie” from several years ago? Barbie, Ken, and friends photographed with their little plastic dogs on all kinds of agility adventures! (Barbie had a substance abuse problem with chocolate!) Wicked funny! Did I mention I got to the AKC Invitational 3 years in a row running a Bull Terrier? This article needs to be formatted into a scorecard… for my friends & I to use for our agility trial spectator’s drinking game. My husband is the agility spouse, who likes to compete some (he also totes and carries, drives, cheer us on when I get excused by the third jump in snooker, videotape, finds people food at obscure trial sites and people watches). We’ll never make it to nationals, but we love it. Our teamwork,happy dogs and partnership makes all the blood, sweat, tears, wipeouts, getting lost on course, exhaustion and expense worth it.